Dollhouse Miniatures Dollhouse for your Barbie Dollhouse Living Environment. fascinate you and your fashion doll world. realism as they play and explore miniatures too. Approx. 8"h x 6"w x 2.75"
Imagine creating a tiny toy room for your fashion doll's children. What could be more endearing than a real tiny house on display? Creating a life-like environment should always be your goal. The more life-like the better to thrill you and anyone else who is admiring it with you. Making your miniature home for Barbie, or any doll, as life-like as possible does get easier as you create and purchase items that mirror real life settings in your home. 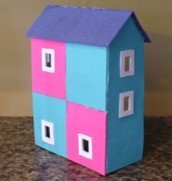 Our dollhouse miniatures dollhouse is the first in designing items for a child's playroom in your Barbie world. Just with that one idea alone, doesn't it just cry, "do more now". The possibilities are endless. Just picture your own childhood or some other child's living space. Then from there just start adding to your mini structure. Letting your imagination run and overflow with ideas. Simply tap into the flow. Then go another step and picture children at play. Chattering and enjoying each others company in a positive way. Oh what fun to create for the pure delight of it all. For no other reason than the enjoyment of life itself. What an awesome scenario! Truly with pieces like this one illustrated, it really becomes fun to create. And enjoyment is what creating for your fashion doll is all about anyway. This little dollhouse miniatures dollhouse is made of polymer clay. Polymer clay is a great medium to work with that does not require a lot of extra work. No painting or tweaking in general. All it needs is details added before you bake it in your oven. Fashioned in the playscale size so that you can see what you own. We hope it fits that place where you'd just like something different to add to your tiny environment. This tiny house is waiting for you to invite it home to your small living places. Making your mini world come alive today! This tiny house is both a collectible and for play. However it is definitely for the child whom you would classify as "one who takes care of her toys". One of maturing standards. It basically is not meant for a younger child, ages 3 and under, as it has tiny parts that a small child could choke on or swallow if unsupervised. So take care in how it is handled in any child's playtime. Scale size: Playscale. Only 1 Available. Not all of these products may look entirely the same as pictured above, mainly because they are all personally handcrafted by Lois Williams. 30 Day Money Back Guarantee if you are not completely satisfied. Please allow 6 - 8 weeks for delivery. Only shipped to Canada and the United States at this time. See as well our Product Return Policy here. Looking for your way of selling miniatures? Why not join our community of crafters here on At the Doll House.com. If you love making it we would love to have you join us. Contact us today. 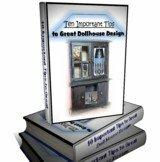 Do you have a dollhouse or dollhouse plans you are wanting to sell? It may be the perfect opportunity for you as well. So get on board and show us what you have in your mini world. People are bound to go wild over your creations. Contact us today.